This is Grizzly! He is a wonderful, fun loving, ENERGETIC dog. He is now a little over two years old. This picture was taken in his "awkward" stage. He is protective, loyal, loving and very aware of people and other animals. His favorites would most definitely be squirrels, t-bones, and drinking out of running water hoses to escape the hot texas heat. He is adorable, and I understand Texas heat, being there myself. 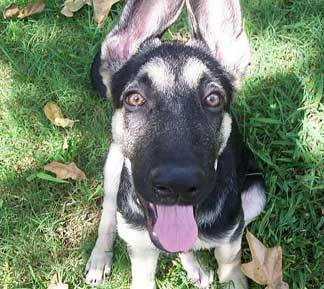 You GSD is dynamite, and he deserves the very best! Thanks for sharing his photo, he is really something. SOmething in his eyes tells me he makes you laugh a lot! Gotta love a dog with a sense of humor!